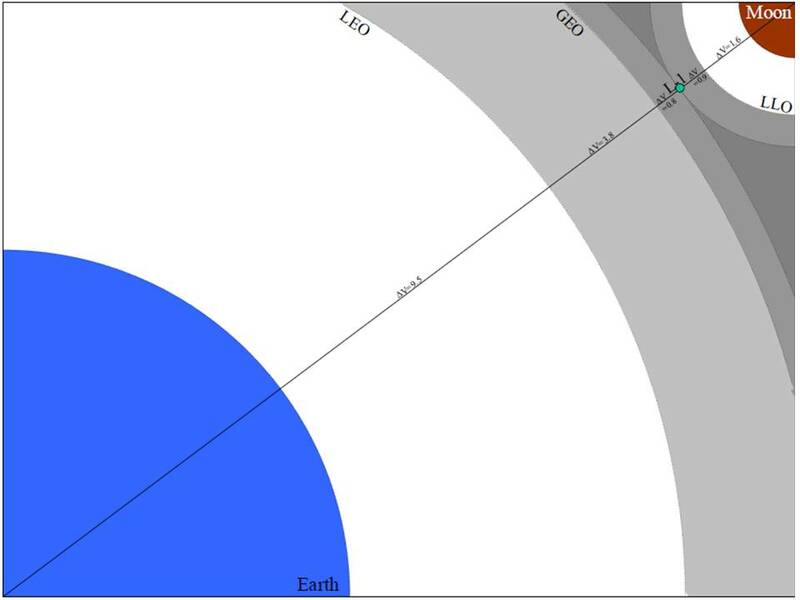 LEO to L1/L2 is only 3.2 km/s if you take slow (>100 days) three body trajectories compared to the 3.8 km/s needed for a fast trajectory. That's a whole lot cheaper than GEO. And between GEO and L1/L2 you can use SEP without problems. I might do quick relook at how cheap we could get the cost if the customer was more flexible with arrival date to L1. 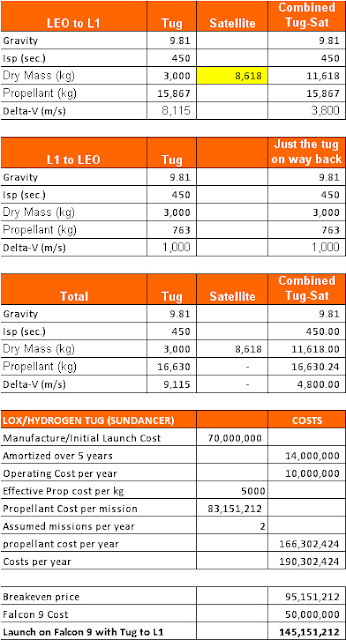 Since I built my analysis assuming only two tug missions per year, 100+ days to complete a single mission would be fine. Of course with increased demand, such “early adopter” discounts may not last long if demand grows. 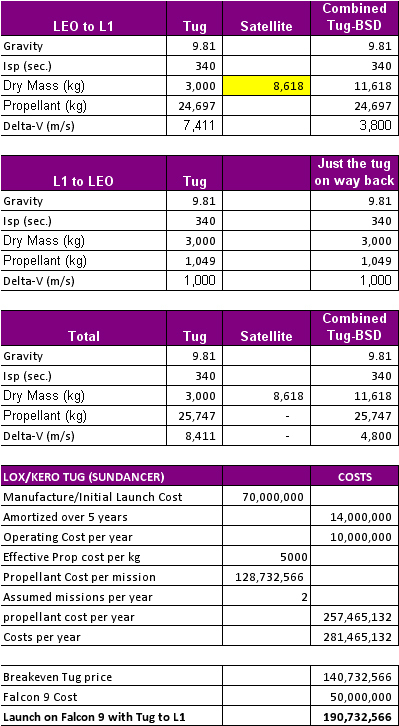 The opportunity cost of a new mission waiting in LEO would become too high for the tug to take the slow road. But in the early days, why not? Good point. With SEP, transport between L1/L2 and GEO could be essentially free, apart from amortisation of the SEP tug which may not be negligible. On the other hand, there is no problem with the van Allens, so the SEP tug could be used many times which reduces amortisation costs compared to a LEO->GEO SEP tug which has to cross the van Allens repeatedly. The tug would also be in full sunlight all the time and the delta-v is relatively small, which helps round trip times and therefore also reduces amortisation costs. 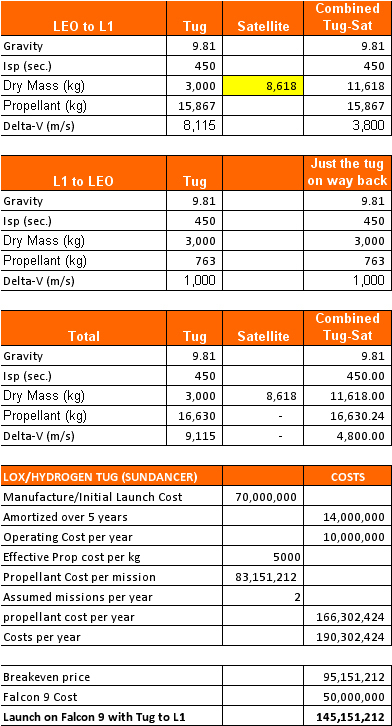 Return from L1/L2 to LEO (or the surface) is also much cheaper than from GEO (0.6km/s vs 1.4km/s). 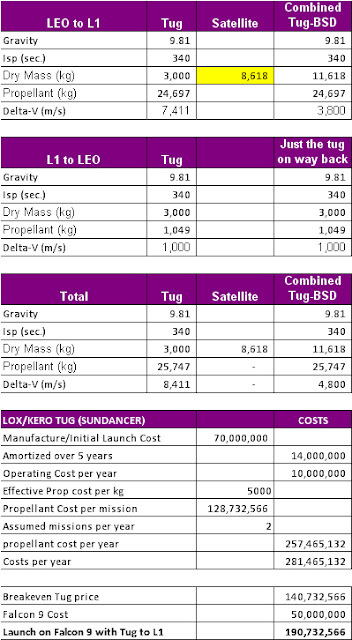 Without more detailed information about delta-v vs delta-t and power density of the SEP tug it is hard to be precise about the costs, but a detour through L1/L2 could turn out to be cheaper than launching straight to GEO. Especially if, like Orbital, you already have the components for a SEP tug lying around. 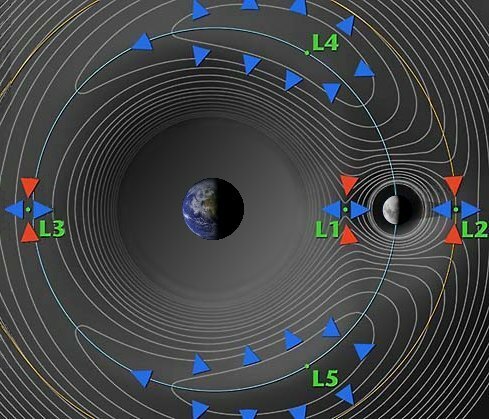 Fast trajectories will be required for human transit missions to and from the Moon in order to minimize solar/cosmic radiation as well as cycling through concentrated Van Allen belt particles. These trips will need the higher delta-V Hohmann transfers (3.8km/s) and high-thrust systems provided by chemical propulsion. SEP and electrodynamic tethers are more suitable for cargo transfer. Two questions: (1) Have you considered the use of water as a shielding material for the L1 outpost? (2) Do your estimates include the mass for an aerobrake? 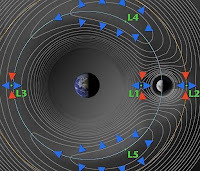 The decreased performance thus higher consumption of kerosene (as compared with Hydrogen) may actually provide an economic incentive for a lunar ISRU plant dedicated to manufacturing liquid hydrocarbon propellants from polar ices that likely contain CO in addition to H2O. Tony Muscatello of Pioneer Astronautics demonstrated this could be done using the Fischer-Tropsch process.